Now that I have free WiFi, I’m going to use my blog to update our fun in Europe and the Viking Grand European River Cruise. The general plan was to fly into Prague via Amsterdam, spend the days getting acclimated and exploring our first European capital. The first trip challenge was using Uber for the first time to get to the airport. I’m trying to shed my old fogey image. It went great. Second challenge was the flight(s). We only had an hour and fifteen minutes for a layover, tight for an international connection. The scramble through passport control turned out to be unnecessary as Schipol was doing repairs and only had one runway open… every single flight was delayed. Ours was two hours late. Zzzzz. Landed in Prague, our Viking host was waiting, yay. Unfortunately, it was after 5:00 pm, several hours late. Still, time to check in to the Hilton and go for a walk around town and get dinner. We checked out Charles Bridge, had a nice local cuisine dinner in the basement level of a building from the 12th century called Casserole. I had pork knee, really. 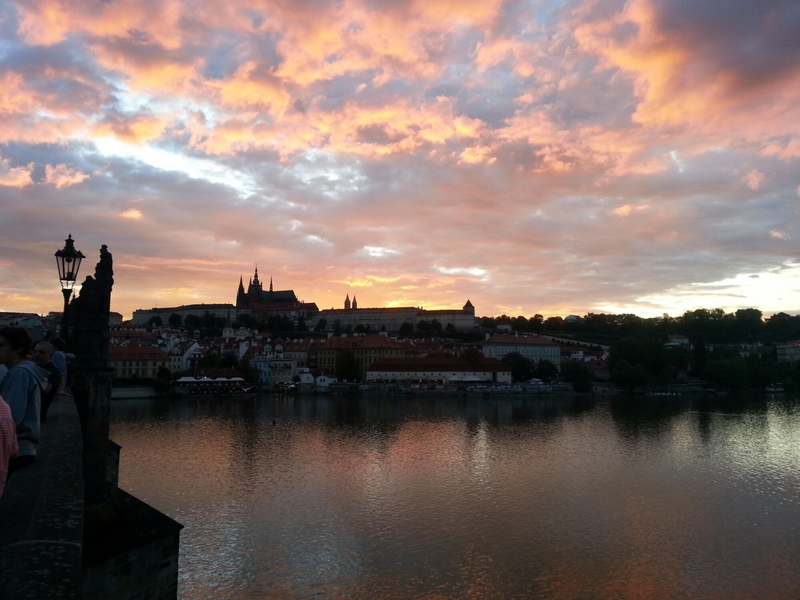 After dinner, we walked back to Charles Bridge to check out the sunset over the castle. It was spectacular. That was pretty much it for Day 1. Time to get some rest, Day 2 has a tour and more walking. finish the whole pork knee? it’s quite a meal if it came with the traditional fixings.